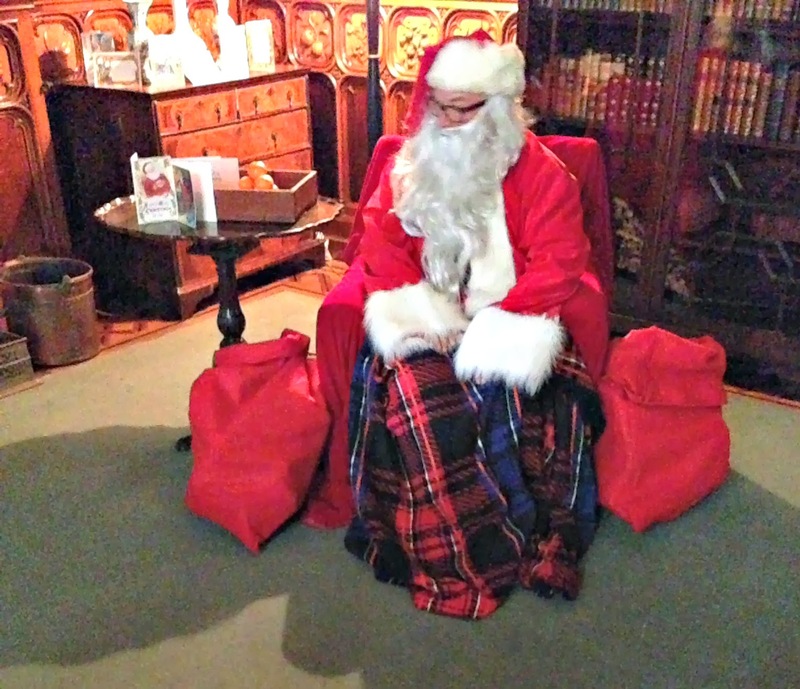 On Saturday we surprised Lucas with a trip to Tyntesfield to share A Very Victorian Christmas with them. 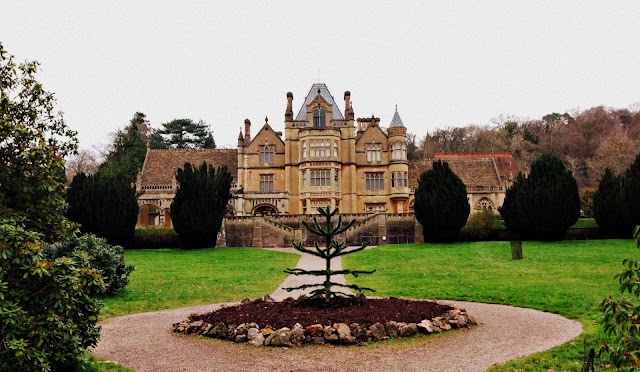 We weren't quite sure what to expect...The event was billed as a romp around Tyntesfield House, which could have meant almost anything. It turned out to be a walking theatre experience which led us through the ground floor of the house. I don't get to the theatre half as much as I'd like to, so I was quite excited about this. Plus, for all the times that we've visited Tyntesfield...I've never been inside the house! We were running a bit early, so we decided to stop off in the cafe for cream tea. This was entirely justified as Dave and I hadn't had breakfast, and Lucas always has room for a second breakfast! 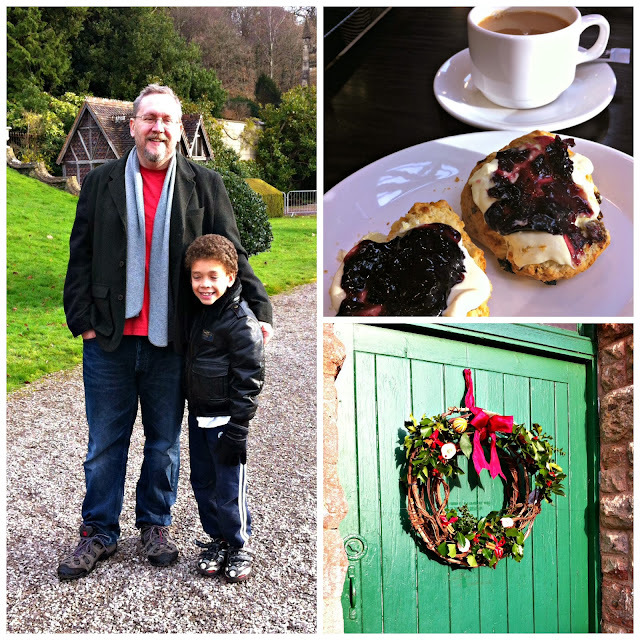 After a very leisurely cream tea, we strolled down to the house and waited outside. 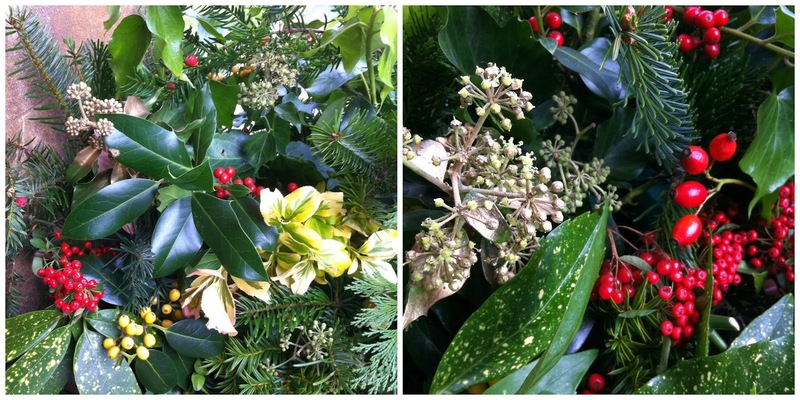 There were some gorgeous arrangements of greenery and berries outside the entrance which I happily admired. 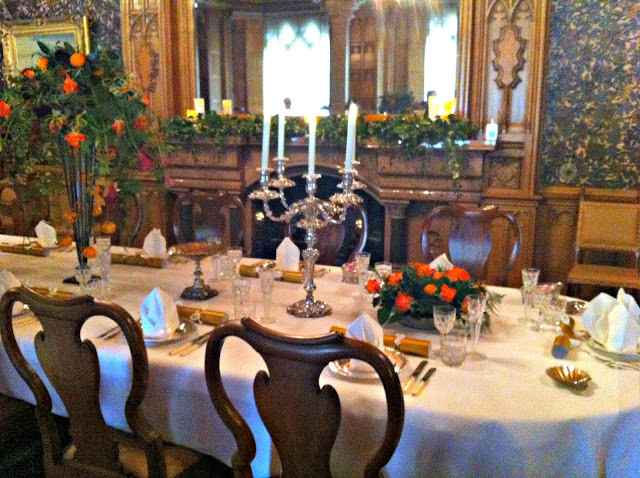 I love all the gorgeous seasonal displays, and there were wreaths hung on almost every door at Tyntesfield! We were welcomed in by Miss Ivy, one of the maids at Tyntesfield and we were immediately immersed into a charming little play. I really don't want to spoil the experience, so I'll just share a few photographs. 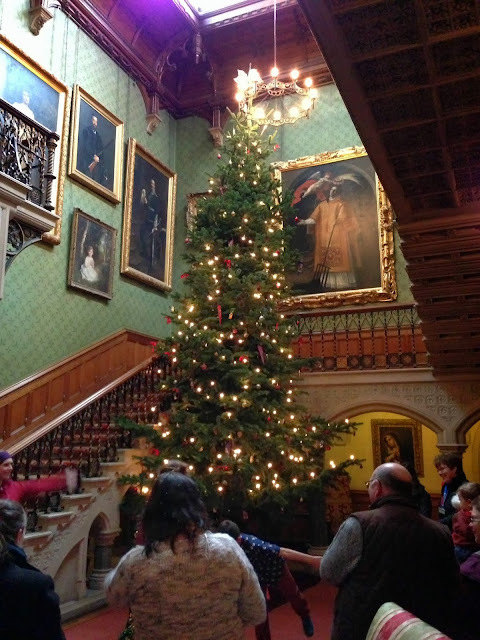 In the main hallway of the house we found the biggest Christmas tree I'd ever seen. It measured in at 7.9m tall and was absolutely stunning! I would have loved a few hours to explore and look at all the wonderful paintings and features in the room. There was a beautifully carved fireplace behind us, festooned with greenery and berries. A roaring fire there must have been a sight to behold! All the actors we interacted with were really fun and firmly in character as they told their simple but charming story. As we left, after a wonderful hour full of laughter and song, we stumbled across a kindly old gentleman in a red suit. In fact, we woke him up from a little snooze! Lucas was absolutely thrilled to receive a present from "the real" Father Christmas! 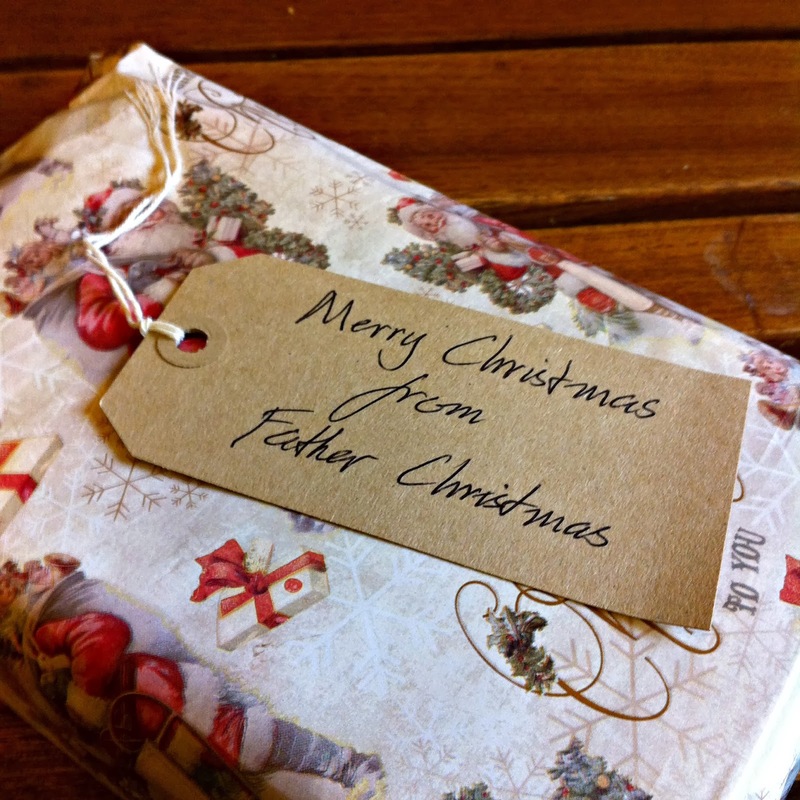 All the grown-ups got a Christmas orange, too--a rare and special treat in Victorian times. We had an amazing time at Tyntesfield. It was wonderful to see inside the house at last, and the walking play was a lot of fun for all ages. I was a bit worried that Lucas wouldn't find it fun as he's a very modern child who loves high-tech stuff with lots of glitzy effects, but he was as charmed as everyone else and wants to do it again next year. I'd thoroughly recommend this if you fancy doing something a little different than a pantomime at Christmas! 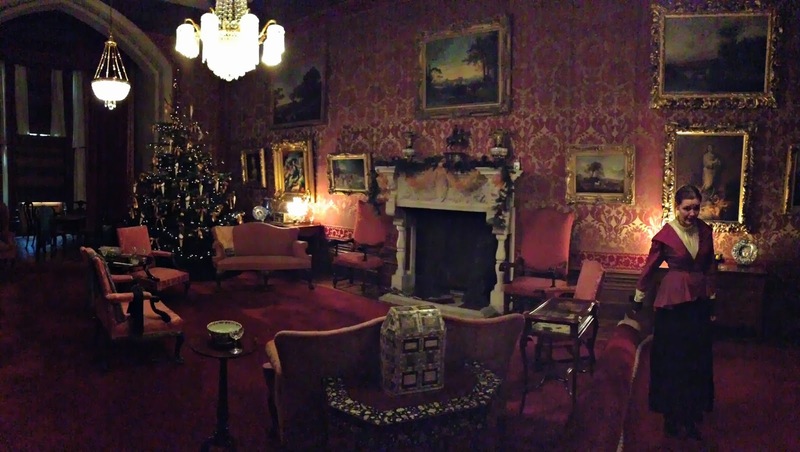 A Very Victorian Christmas takes place again at Tyntesfield this weekend (21 and 22 December). Booking is essential. I read this twice!! I wish I could do it! That would be a long trip. I actually had to look up what 7.9 m is in feet and it's taller than our 17 footer! (5.18 meters, according to Google). You do the best stuff ever! It's made me add "go to the theatre more often" to my New Years Resolutions, that's for sure! I loved it. This looks beautiful! What a great trip! It really is! It's one of our favourite places to go. Thanks, Miss Melvis! We all had a wonderful time, especially Lucas!